2.1 Legal Definition: What is a disability under the DDO? 1Under the DDO (Cap. 487), a disability means total or partial loss of a person's bodily or mental functions, total or partial loss of a part of the body, the presence of organisms causing disease or illness (such as HIV), the malfunction, malformation or disfigurement of a part of the person's body, or a disorder, illness or disease that affects a person's perception of reality, emotions or judgment or that results in disturbed behaviour, and learning difficulties. A disability includes not only a disability which presently exists, but also a disability which previously existed but no longer exists, which may exist in the future or which is imputed to a person. 1 Disability Discrimination Ordinance and I, Equal Opportunities Commission. 2.2 Who are Students with Special Educational Needs (SEN)? 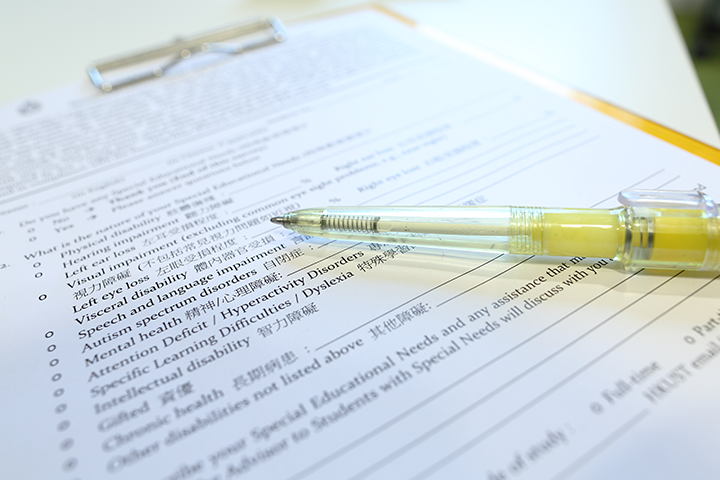 If a student is diagnosed or suspects his/her difficulties are related to any type of SEN, he or she is strongly advised to contact the SEN & DiversAbility Team (DA), Counseling and Wellness Center, right away for the verification of the disability. Confidentiality to all personal information provided is guaranteed.